I was not wrong in telling in the previous post this tallest man in the world wants to be in headlines. Or is it the shortest man who wants to be in the headline? 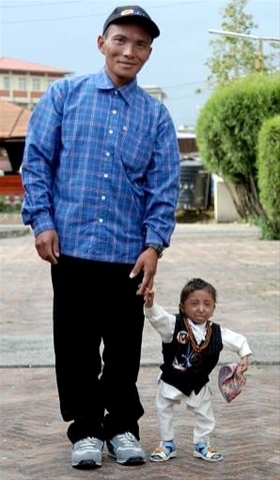 In the latest news he met a person who thinks himself as the the shortest man in the earth. 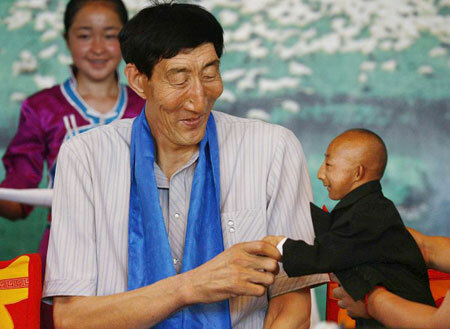 Bao Xishun, the tallest man shakes hands with He Pingping, who is currently aiming for a place in the Guiness Book of Records as the world’s shortest man. The historic meeting between Bao, who stands 2.36 meters (7.9 feet) tall, and He, who only reaches 73 centimeters (2.4 feet) in height, took place in Baotou, in China’s Inner Mongolia Autonomous Region on Friday. Bao became officially recognised as the world’s tallest man last year, beating the previous record holder, Radhouane Charbib of Tunisia, by just 2mm. Mr Pingping was born in Wulanchabu city, Inner Mongolia. His father claims he was only the size of an adult’s palm at birth. 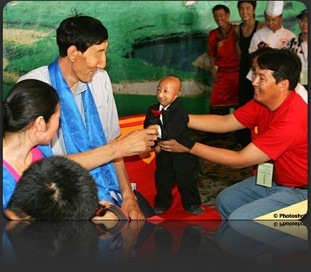 He is now seeking to be registered as the world’s shortest man by the Guinness Book of Recrods. He could be in for a disappointment though. 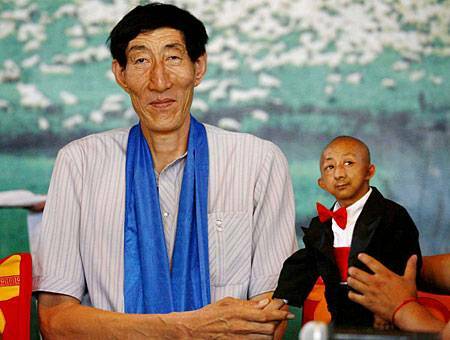 While Mr Pingping is 73cms tall, the current holder of the title Lin Yih-Chih was measured as 67.5cm. I think your articles are great and well written, (which is a big plus considering the surprising number of people that cannot write at all in the online community). I just thought you might find it interesting to know that the tallest man in the world is Leonid Stadnyk, a 33 year old man living in a remote village in Ukraine. He measures at 2.54 metres, beating the current Guinness world record holder Radhouane Charbib, from Tunisia, who measures 2.36-metres. Stadnyk is shy and reluctant to come into International fame because of a disease that is making his life terribly difficult. He has yet to stop growing! That is fascinating. I love to meet these people somehow. They are more human than I am. ?? ???? ?? ????? ???? ? ????. ????? ?????????? ??? ????! ?????????? ?? rss. ???? ????????? ??????. Pingback: Tiny Dancer « Chairman Wow! LOL what a mess eh? may i please buy him on ebay ? unless you know where i could get another …? i can’t believe my eyes, is this a joke or something else? Oh gosh this is crazy he’s so tiny! Arman likes very much, he is studied in Stewart.